The Maen Karne Group comprises of Maen Karne Aggregates and Maen Karne Concrete Products. The company is the south west’s leading fully independent supplier of bagged and loose aggregate. It specialises in muck shift clearing and bulk haulage, transporting more than one million tonnes of aggregate annually. Maen Karne also manufactures concrete blocks and ready-mix concrete. Its CE approved portfolio includes a full range of different size and strength concrete blocks for any application. These include block and beam floors, paintable grade finish, foundations, hollow blocks, bricks and commons. Maen Karne has sites at Melbur, Hayle and Penryn providing coverage throughout Cornwall and into Devon. The company is renowned for producing quality blocks and certified ready mix concrete across the region, delivering up to 1440 blocks per load to larger sites. To assist with the substantial amount of blocks moved daily, the Southwest’s leading bulk bag and loose aggregate supplier contacted B&B Attachments to provide a solution for handling its wide range of concrete blocks. B&B Attachments specialises in the design and manufacture of bespoke forklift truck attachment solutions, creating products for customers with specific material handling requirements. Discussions were held with Maen Karne to understand its requirements to ensure flexible delivery, on-site safety and increased productivity when handling its concrete products. 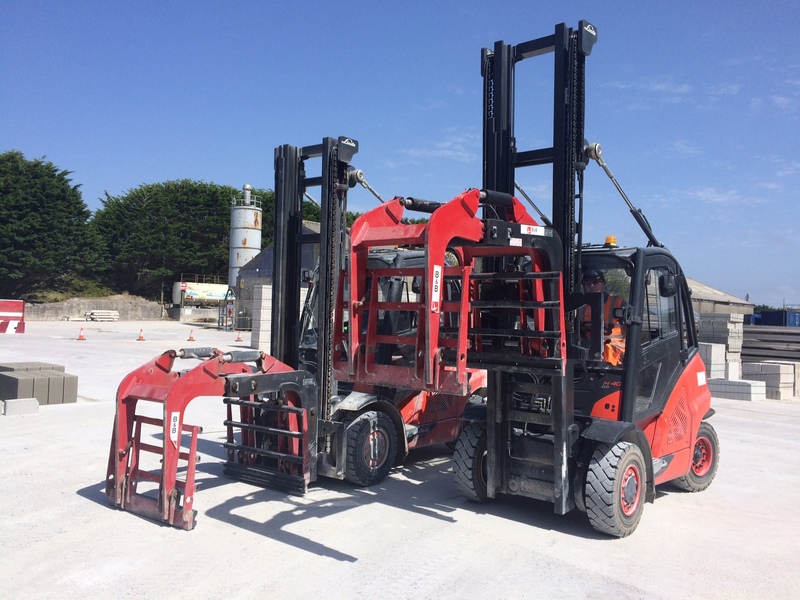 B&B supplied the concrete manufacturer with two WR20 attachments from its BlockMaster range. The BlockMaster WR20 is a sideshifting clamp with a pivoting arm that ensures optimum performance and maximum productivity when handling single brick or block packs. Rated at 2000kg and with an inside height of 1100mm, its heavy-duty sideshift capability incorporates high density nylatron wear bushes and chrome cylinders. Its outstanding visibility, chrome slider bars and hardened steel bushes provides the ideal solution for loading flat bed and curtain sided vehicles and moving products on site in a safe and efficient manner. The BlockMaster WR20 is ideally suited to yard work and loading, and is designed to provide a safe and efficient material handling solution, whilst also eliminating the risk of any damage to the concrete. “These attachments provided by B&B attachments have made a big difference to our on-site productivity. It is paramount that we are handling our products in the safest and most efficient way possible and the BlockMaster attachments ensure this happens,” said Martin Kidd, Site Manager at Hayle Maen Karne.